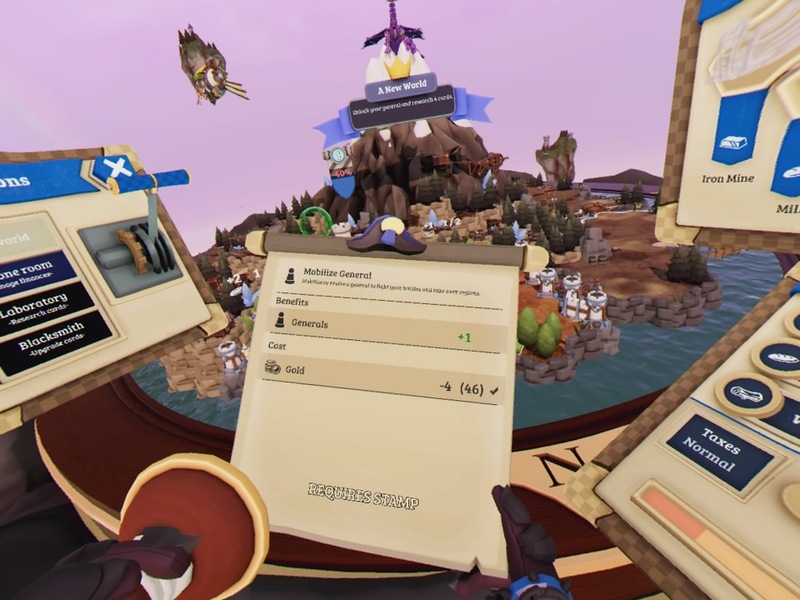 A VR game that doesn’t involve shooting or surviving waves has arrived on PSVR. Hurrah! Skyworld is a strategy game, letting you develop a simple kingdom whilst competing with a rival. You’ll need either one or two Move controllers which will allow you to manipulate the world and place buildings and combat units. You play as a king who has control over the entire kingdom. Demons have infested the world however, trying to create their own kingdom, and you must drive them from each location. Characters talk to you to progress the story and new characters turn up but really it’s quite easy to ignore. There is also a skirmish mode if you just want to get into the action and an online mode if you want to face another human. Each level starts in a building phase. Here you have a castle, some workers, some materials and that’s it. This is all you need to start creating your kingdom however. There are set spots where you can place buildings. Building a mill and employing some workers in it will start creating food, which you’ll need to keep your workers happy. Build a saw mill and put some people to work in it and you’ll start creating wood with which to build more. Skyworld is turn based so once you’ve done all you want to or spent all your materials then you’ll need to end the turn. Doing so will generate whatever materials you’ve got on the go, plus gold from taxes and you’ll lose food. Getting a strong economy to develop your kingdom and also empower your army is the key to victory as your opponent will be doing exactly the same. You’ll need a general to branch out into new territories which will give you new building spots, allowing you to enhance your kingdom even further. More workers will be necessary to man these buildings so you’ll have to entice more to join you. This is done by balancing taxes and food. Tax people too heavily and you’ll actually lose workers, supply more food than you’re taxing and extras will come join. More workers means more mouths to feed however so you’ll need to continue producing food in greater numbers to keep everyone happy because you will need to tax them at some point to use the gold to build and develop your army. Battle takes place when you encounter an enemy general on the map or attack/defend a castle. This takes you to a different area where you have a fortress at one end of the map and the enemy has one at the other. Two towers flank the fortress and fire upon any enemy units that come close, but these can be destroyed. You start off with a basic army but can develop more powerful units using materials on the kingdom map. Mana will slowly build and you’ll have four cards in your hand. Each represents a unit and costs a certain amount of mana to summon, weaker units costing less. 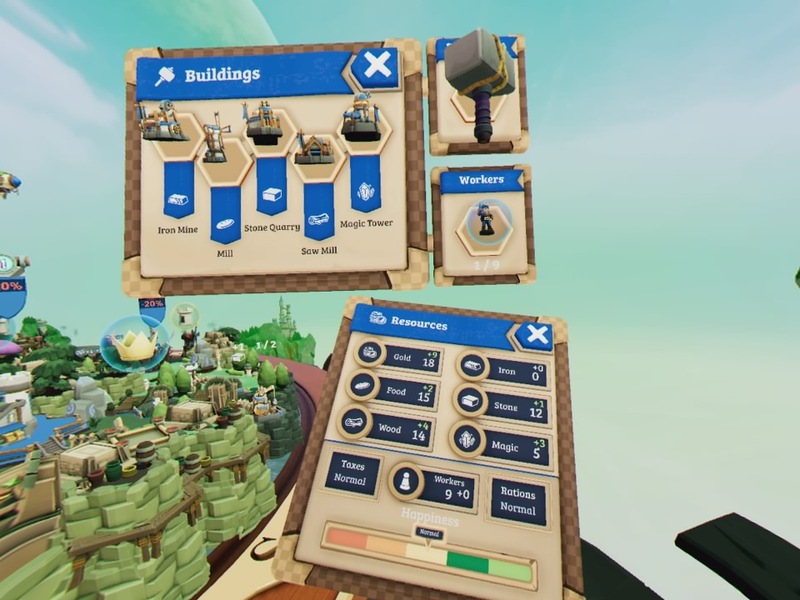 Unlike the building portion of the game the battles take place in real time so you’ll want to send your units as quickly as you can across the map. You just place them and they start walking towards the enemy, though there are three lanes they can take which you’ll want to do to intercept enemies or get a free run at one of their towers. If you control the central portion of a lane then a blimp will also help fire upon the towers and fortress which are incredibly helpful. If you have more than four different unit types then as you use one a new one will cycle in and using the right unit for the right situation will help you immensely. You can flood the map with weaker enemies quickly, cast a spell for a quick hit or be patient and send a stronger unit that might single handedly turn the tide, but they can only be in one place at once, possibly leaving you open in another lane. Destroy your opponent’s fortress and you win, if yours gets destroyed then your general is killed and you’ll have to pay to hire a new one. The goal of the game (though the campaign levels vary) is to destroy your opponent’s castle. To do this you have to make your way across the map and attack the castle directly, though the further you get from your own structures the more of a penalty you take in battle. Building up your kingdom to develop the materials needed to strengthen your army is always your goal as this will ultimately win the stage. Using one or two Move controllers is pretty intuitive and there is an interesting interface. The map is on a flat circle which can be rotated and dragged around to give you a better view. The rotation of the map was actually the part I found worked least well with each twist of the map not rotating as much as you’d hope. What works really well though is that you can move the different menus around and place them wherever you please. I personally liked having the building menu to my right, where I could grab buildings to place when I needed to. My materials list which showed how much I had was under that so I could glance at it easily. Above my head I’d place my army selection which would show me what units I was taking into battle. To my left I always put the lever that let me go to different screens (for changing the tax rate and building new units) and the end turn button. Being able to physically move the menu wherever you like is a great feature that I really appreciate and hope other games use in the future where suitable. Getting around from menu to menu works well and other than the map rotation I found everything worked as intended with the motion controls. Unfortunately I found that the gameplay was a little too simplified. Different maps apply bonuses to different panels allowing you to earn more wood, for example, if you put a saw mill in that spot, but really you’ll always want to approach a game the same way as you always need the same materials to start off with. Having the battles load into a different area also makes them feel very separate from the kingdom building and although I was never bored whilst battling you are just grabbing a unit from your hand and placing it down in the appropriate lane. Obviously poor play can lose the fight and put you out of pocket and controlling the middle of the map is important but at no point did I feel like I’d outplayed my opponent to win. There are eight campaign levels which you can play on Easy, Medium or Hard. I’m not 100% sure how long each takes, being in the VR headset, but each level is a decent chunk of time, probably approaching an hour. You can save mid-mission if you like though you can’t pause the battles annoyingly. Visually things hold up well. The characters and units are very simple but the map itself is chunky and colourful with lots of little details. Your opponent has an avatar which moves as they move which can be slightly customised which is a nice touch. Voice acting is passable at best. 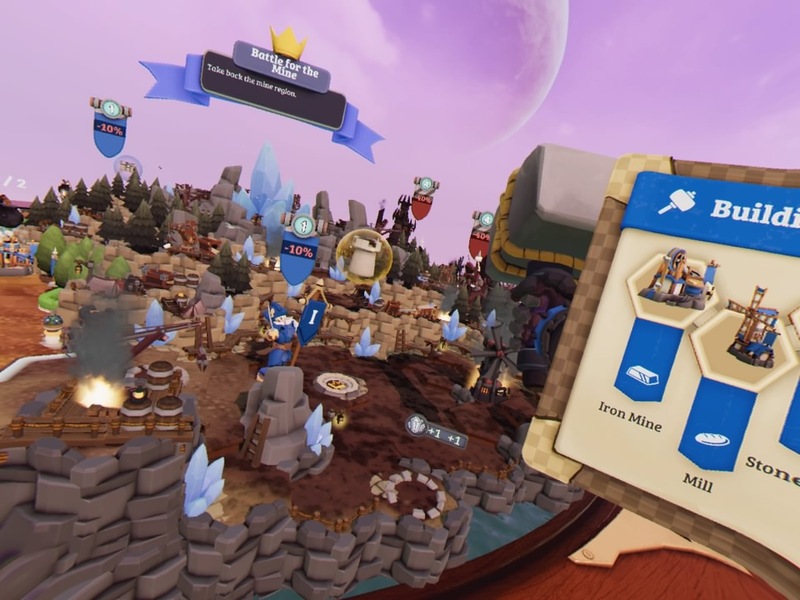 Skyworld is a nice change of pace from the shooting galleries that flood PSVR and those looking for a strategy game will enjoy your time with it, especially if you get into the multiplayer and can find games consistently, but I found it to be a little too simplified to hit that Civilization spot or the tactical combat of an XCOM. They’re very different games but they’re the benchmark for kingdom building and battling as far as I’m concerned and Skyworld is far shallower than either resulting in a reasonably fun but throwaway experience. 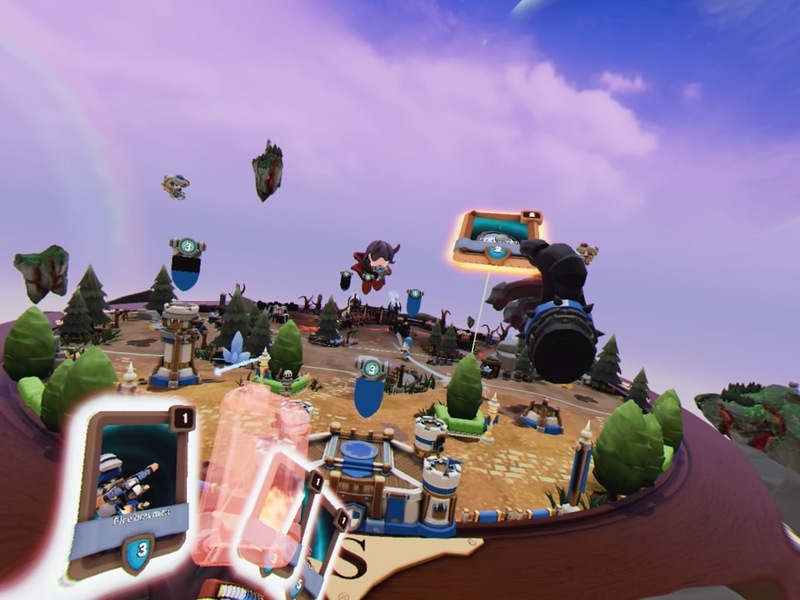 Skyworld is a fun strategy game for PSVR with tactical battles. 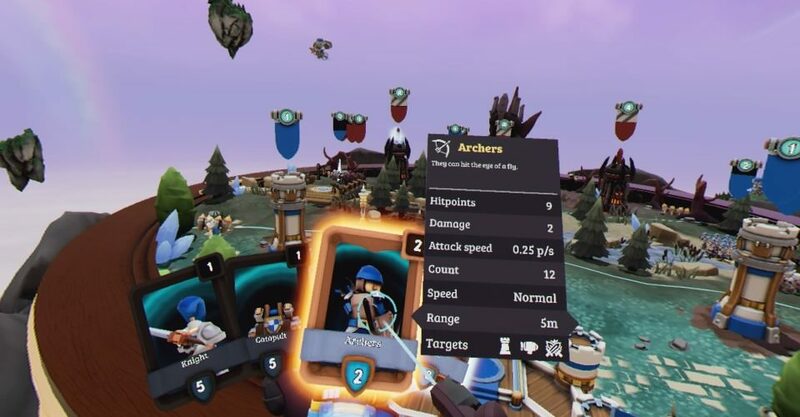 The mechanics are too oversimplified to leave a lasting impression but the UI manipulation will hopefully inspire other VR developers to think outside the box.